Saundra Davis of Sage Financial Solutions is an adjunct professor, a coach for financial planners and coaches, and an advocate for financial wellness. She’s also incredibly passionate about understanding how to meet people where they are - and that means balancing financial wellness with cultural values and mental health. Saundra is here to help us understand how to ask questions as financial planners, or money coaches, when working with a diverse client base. She’s going to walk us through different money values, and how we, as advisors and money coaches, can stay in the mindset of curiosity to help our clients build their best financial lives. Too many advisors feel uncomfortable working with a diverse client base because they don’t fully understand different money backgrounds, or cultures. There’s also a sense of judgment that may come from an advisor or money coach if we don’t understand the “why” behind how people spend their money. In this episode, Saundra is going to help us understand how to get to the need under the need - because it’s never just about the money. Working with clients on their personal finances can be challenging, and it will be even more challenging if we don’t look to approach our diverse client base with curiosity, openness, and the ultimate goal of helping them find their best financial life. You don’t want to miss this incredible kick-off episode to Season 3! Rianka: 00:00 Sandra, welcome to 2050 TrailBlazers. Saundra: 00:04 Thank you Rianka. I am so excited to be with you. Rianka: 00:07 I am so excited that you're here and I am truly blessed. 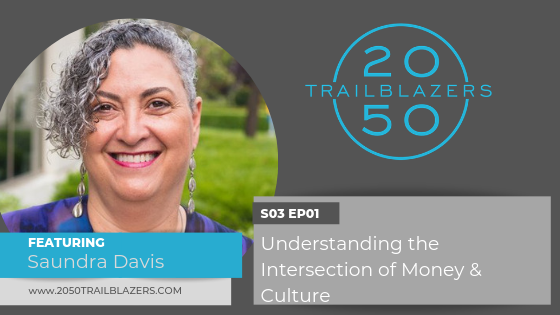 Our paths crossed a couple of years ago at that conference, you know we are officially kicking off season three of 2050 TrailBlazers and this season's theme is money and culture. Let's get excited everyone. I think it is fair to say that one taboo that transcends many cultures is money. We just don't talk about it. So to kick us off, I thought it would be phenomenal to have a world traveled decades of experience, distinguished adjunct professor, the financial coaches coach to join us and educate us as we get into some real deep discussions about various cultures and their lens of money this season. You know, Saundra, when we started talking about this, you had mentioned, and I agree with you wholeheartedly, that sometimes as financial planners we put financial health above cultural values without understanding their lens. And I want us to start there. Saundra: 02:50 of all of these different cultures from all of these different countries, right? And so and continents and so it's not abnormal if you think about it in that context of why there are so many diverging perspectives. And, and how do we then, as professionals, if we say we're meeting people where they are and we want the highest and best for them, I don't think we can do that without ignoring their cultural context. Not only from, you know, what their financial situation is or their family situation, but, but what do we bring with us, you know, from the communities that were raised in, from our spiritual practices, how does all of this show up? And then how do we as financial professionals make sure that we're not ignoring what, what we say matters most, which we say, you know, let's focus on values. Let's focus on, you know, what are the things you care most about? But then we immediately flip over to, well, you know, your Monte Carlo simulation says blah. Right? And so how do we, how do we truly stay in the place of being with people in all of their stuff, right? That, that comes with it and bring the money conversation in a way that isn't harmful, judgmental, shaming or blaming and still helps people get where they say they want to go. Rianka: 04:18 Absolutely. Wow. See, you see why I brought Saundra on, she is about to school all of us and I'm here for it. So I love that intro and I want to touch on so many things in our conversation today. One of the things I like to do, especially for the listeners, is to define things because we hear a lot of jargon, a lot of words thrown around, and one of the ones is a financial coach or a money coach. And we're seeing a lot of that. In, just on social media and the news. So from your perspective, just so we can lay the ground of, of the work that you do, from your perspective, what is the difference between a financial coach and a money coach? Saundra: 05:05 Yeah, so, so honestly, unfortunately all of these words are being used interchangeably, very much like in the financial planning profession, right? So anyone gets to call themselves anything. And I don't judge people's, terminology. I think people use the words that will help them market their work best. I interpret financial coaches as comprehensive in our work. And that is why for the work that I do, I require people have a comprehensive understanding of someone's complete financial life cycle. Whereas I, and again, I see many financial planners using the term money coach, so they may be doing comprehensive work. I can't really speak to what they do. What I will say is that, people use language, to connect. And so when I think money coaching, I'm thinking specifically about how people are dealing with, the, the day to day operations of what we do with our dollars. Saundra: 06:08 Now that is not to say that's anyone else's definition, but that's how I distinguish it. So, you know, I know a lot of people call themselves a lot of things and the only thing that I would say is how are we serving the people that we serve? So I distinguished coaching in and of itself as being client focused. Client directed, the client chooses the topic and the pace for, for progress and I hold the process with them. And so where that, how that looks different from, you know, maybe other interventions is that if a client makes a commitment to themselves that they then don't honor, my job as their coach is to ask them what's up with that. So I as the coach, I can't let somebody go, you know, two, three, five, 20 years not adhering to what they said and not saying anything about it. Saundra: 07:04 So I know, I know some financial planners grapple with, well, you know, the client is, has to implement, what do I do? What do I say when they don't adhere to the plan? And some are kind of afraid and maybe even tip toe around the topic because they don't want to get fired, a completely valid perspective or, or feeling. But the question then becomes, what duty do we owe the client if they are not, living up to what they say they want. And so from my perspective as the coach was, see, here's the thing, I frame that from the get go. That's not a surprise to clients. You know, when I say, hey, so look, I noticed that, you know, you said you wanted to keep your spending under Blah for the quarter. And I'm noticing is way above Blah what's happening, you know, what's going on and, and more importantly, what do you want to do about it? Rianka: 07:56 So what I'm hearing from you is that well to kind of like circle us back. You know, as a financial planner, what you're saying as far as being a financial coach, I feel like I wear that hat. As financial planners we wear so many different hats. A financial coach sometimes we're a marriage therapist, sometimes we're a family therapist. Yeah, just working through money, money, history, what, what you grew up, your money script, can really affect us as an, as adults and how we spend or, or use our money. So, thank you for laying that foundation of just, you know, your lens, your perspective of, of what it means to be a good steward for the client. You know, and what I hear you also saying is that you share expectations upfront with the client. So a lot of, there's a lot of non financial planners, but also a lot of financial planners who listen to this podcast. Rianka: 09:06 And I would love to be able to support the financial planners who have reached out to me and have asked, you know, I want to work with a more diverse set of clients, but I don't know how. And, and I think the, I don't know how is the, is the tip toe-ness around like I know that they have a different culture. How do I start to ask questions to make sure that is not an a in an accusatory manner, but more so of like, I really am intrigued and want to learn about your culture and I don't want to offend you. So, and I want to meet you where you are. So you have done extensive travel. I'm so happy. I have, had a chance to catch up with you. And if I'm recalling correctly, are you just coming back from a trip? Saundra: 10:01 Well, I'm kind of just coming back from a trip. Rianka: 10:05 And where did this last trip take you? Saundra: 10:07 This last trip was Benin Togo in Ghana, in West Africa. Rianka: 10:13 Wow. And you shared a story with me. And I want you to share it with the listeners as well because I think it's going to get into some real good conversation. Saundra: 10:23 So I recently traveled and, and, and we take a trip back to the continent every year and this year we were in west Africa. And one of the things that we notice is that there's this perception that Africans in the diaspora and particularly Africans in America come back with a lot of money. So we, we come back, we have wealth and, you know, of course people there are just like people here in the US working to survive and if part of what they do is sell their products and sell things and you were really can be on your tour bus and buy everything from dashikis to musical instruments to chargers for your cell phone. And so they come up to the buses and, when you're at some of the tourist sites and they come up to the buses to sell things and about the fourth day I'm, I'm really kind of tired and, I wasn't buying anything else. Saundra: 11:15 A part of what I do is I go there with money knowing that I'm planning to leave money in the community because that's part of what I believe my role is when I'm traveling. But I wasn't willing to buy anything. And it doesn't matter whether you say yes or no, they're still going stay stand there and sell. You try to sell. And I saw an elder sitting off to the side. And so, I grabbed some money out of my wallet and went over to the elder. And even though the young men who were trying to sell me products, we're still like, you know, buy this, buy this, buy this. They saw me go over, put money in the elder's hand. And as I was walking back, the gentleman stopped trying to sell me something and he said, thank you for taking care of our elder. Saundra: 11:55 And I got back on the bus and you know, and that part of it was done. And what stood out to me about that is that even in the hustle, right? Even in, and I don't mean hustle in a trying to hustle me, I mean the hustle of working hard to try to prepare your you for your needs, take care of your family. Even in that the respect for me to take care of the elder was acknowledged, right? The appreciation that I saw her, number one and, and cared enough about her to get off of the bus, thank her and give her the money that I had. And then for him to acknowledge, that was really significant because what it showed me was yes, in all of the mix, the underlying values are really what matters most. And he cared more about her than about me buying something from him. And so I was, I was mutually appreciative. He was appreciating me and I was appreciating him. And, and that was kind of the, experience that I had literally from one location to the next all over the places that we went. Rianka: 13:02 It's making me think about some of the clients that I have who have immigrated here from Nigeria or Ghana, is that in their culture, and this is something that we talk about as far as like their full comprehensive plan. And when we go into like cashflow, budgeting is that they always have a line item for their parents. And they share it with me that the eldest son of the family is financially responsible for the parents. Even if the parents are financially well off, you know, they're still back in in Africa. That son has a responsibility, for, for their parents. And so with the clients that I work with now that I know that I, from a culture perspective, I never questioned that. It's more so of how can we make sure that you are not only taking care of your financial household, but you are also still able to without the detriment of your financial health, still able to financially support your parents and for them to see like, wow, she understands my culture. I think that is why my clients stick with me for so long is because I have an appreciation for how they value their culture and then also the money. Saundra: 14:36 Yeah, absolutely. And, and you know, Rianka to your earlier question, when people want to work with diverse clients, I think this is one, one of the things that makes coaching so magical. Now I want to say full disclosure, I think financial planning is the best thing ever. I think being a comprehensive financial planner is one of the very best services that people can offer. And that is because while financial planners might not do everything, you all have to think of everything. And, and to me what you offer, what you all do when you're doing comprehensive planning is you're making sure that you're not only looking at what's obvious, that you're also having an eye toward the things that most of us miss, you know, and, and those emotional things that get in the way of us doing well with the resources that we have. Saundra: 15:30 And so I just want to say that first of all and this piece, to your question about, you know, how do you deal with diverse clients if you don't feel culturally competent? This is why coaching is so crucial. Because as a coach, it doesn't matter who I'm sitting across the table from or quite frankly next to cause I don't sit across from the table, but who I'm sitting next to because my first question, once we're ready to look at what they say their goal is, okay, what do I need to know about this? What do I need to know about you? What do I need to know about what matters most to you? So once I lay that foundation, they don't have to rattle off all of their cultural stuff to me, it is going to come out. And if I'm staying in the beginner's mind and I'm staying with curiosity, the, if someone says, well, you know, I got to make sure that I cover my parents. Saundra: 16:24 I would say so. Okay. So tell me a little bit about that. What does taking care of your parents mean to you? How will you know when you're doing it to your satisfaction? What things are you willing to adjust to make sure that you do that? You know, so rather than go to the place of, wait a minute, what if that means this, that and the other? I don't go there. You know, because they have to decide that now in all fairness, a comprehensive planner still has to look at that Monte Carlo. Right? So, so how do you all, you know, I don't have that. I don't have that barrier, so I get to stay in that coaching seat. Whereas for you all, you have to balance those two things. And so I would invite people to really in the beginning, make sure that you truly do make space for people to say the things that are really important to them. Rianka: 18:16 Oh, no, no, no, no. Okay. Hold on. Let's pause right there. Okay, let's put a pin in that because that's something that I learned very early on. I think it was maybe my first year out of, out of college, you know, working at a firm I saw how much, well one, let me make a disclaimer here. I was working with, with millionaires, like they had at least a million dollars of investable assets that that does not include your home, of, of investable assets. And so their income was enormous, bigger than I've ever seen in my life. I didn't know people can make that much money. And I saw how much they were spending on, like day camps for the children. And I saw how much they were spending on eating out on a monthly basis. And I had made a comment to an, to one of the senior advisors, it was just like, wow, like this is a lot like, oh, this is probably why they're living paycheck to paycheck. Rianka: 19:19 And she said to me, she was like, it's not our place to judge how they spend money. It's our place to have them figure out where their values are and for us to highlight where their values are and see if they're not spending in their value. You know what I'm saying, Saundra? Like, and so that, and that was like the best gift that that advisor could have given me nine years ago, almost 10 years ago. And so now I don't judge, so to say, especially to a black family, an African American family, to not tithe 10% to their church, you're probably going to lose that client. Saundra: 19:59 Right. And, and you know, of course, different families have different religious beliefs or religious practices. What they do with their money is related to religion. And all of that is very important. Right. And I think you're right that that planner did give you a fabulous gift, which is probably why your approach is so coach like now. Because when we learned that early on, and I was really fortunate, you know, my first entry into financial planning back in the early two thousands, you know, I met, you know, Ed Jacobson with Appreciative Inquiry and I hung out with Brad and Ted Klontz to learn about the behavior in money. So I learned very early that my knowledge was not going to change someone else's behavior. And, and despite having a master's degree in financial planning and all of those things that I do to make sure that my, my content is tight, means nothing if I can't meet people where they are. Saundra: 21:45 Yes, they expected and I do not disappoint. Rianka: 21:48 So what I'm hearing, I feel like that was like an evil snicker of just like, ha ha ha. Rianka: 21:59 So what I, what I continue to hear from you and what I want to kind of like amplify for the financial planners who are listening is that set very clear expectations up front. And then they don't have to be just like whiplash when you're, you know, questioning, not necessarily questioning but holding them to keep the promises that they made to their self. Saundra: 22:21 Absolutely. And I often call it holding up the mirror and I'll tell them, you know, if what you're doing is getting you what you want is and is congruent with what you say, you want the desired outcome to be, terrific. Keep doing that. If what you're doing is not getting you what you want, what do you want to do differently and then how do I support you in number one, figuring that out and then staying on task. You know, some financial coaches work with people for years. Saundra: 22:49 I tend to work in shorter spurts now just because of what my life looks like. But there are some, financial coaches who continue with clients year after year after year to actually implement the plans and quite frankly. That's where I think it's most helpful. And even, you know, getting back to kind of the things that you have asked me about with regard to the different cultures and the different things that I'm seeing, I have to pay attention to how different people work, what works for them and then I serve them based on that. And culture is a huge part of that. Rianka: 23:21 So let's dig a little deeper. It's something for season three with money and culture that, I want to bring to the table this season is that I want to bring on different just people and planners from various backgrounds. So Asian American, African American, African, you know, Latin x, I'm so, I'm gonna bring on a variety of different types of people, types of culture, so we can really dig in and learn about their various cultures, learn about immigrants, what is their experience and why the financial services industry or just honestly, the banking system is so foreign to them. I think it's really important, especially just like, as you mentioned, I like to call America, a mosaic, beautiful many different pieces all put together. That's what we're growing into. And in order for us to be able to effectively serve our clients, we have to understand them, at least the tip of the iceberg so that we can be able to dig deeper. But so that's going to be season all three now. But for our conversation today, what you just mentioned I think is, is really powerful and I want to dig into it, that, you know, depending on their culture, you know, depending on the person that you're sitting beside, the client that you're sitting beside their culture is, is, will depend on how you, you work with them or how you approach various conversations. Let's talk about that a little bit more. Saundra: 24:56 Yeah. So I think the first thing is that I don't make any assumptions and I don't try to behave as though I understand, what their experience is. I can empathize, you know, I mean, I can, I can hear something and there might be areas that I have a similar experience, but my experience is not the same. I am a black woman, born and raised in northern California and I have a very specific lens and specific experience. So if I'm dealing with, a man from the south, you know, I, I have to let him and his perspectives, in his experience, guide me in how do I support him so he doesn't have to fit into my lens. I have to be able to hear what he has to say and listen for what's important and then reflect back what I think I hear. So I can't just say, okay, he said it. Saundra: 25:55 So that's the most important thing. I actually have to take a moment to say, okay, so what I'm hearing is this, rescue me if I'm wrong or you know, what did I miss? Something that gives people permission to say, yeah, kinda or no, you missed it completely or you nailed it. Right? And so then that is what gives me the confidence to share the information or the expertise that I have based on the indicators that they've given me the green light; okay, yes, I'm on the right road. This is the thread to be pulling. Let's go with this. And I say this because you know, I, I have some amazing colleagues in the field and, and they share with me some of the experiences that they have. And one friend of mine, she says, you know, she was working with this client and the client really was gutting her retirement account for college, for her daughter. And you know, the, the, the planner was just saying, well, you know, this is going to be harmful. It should, the plan was really dedicated to advocating for the client to not do that. And, and apparently the client acquiesced and you know, didn't do it and came back to the planner later and said, you ruined my life. Saundra: 27:11 Yes. And, and so we have to understand that when someone has something that is core to who they are, you know, values are more than a word. It's more than an exercise. What are your top five values? That's scratching the surface. We, when we're talking to people about their financial lives, there is nothing that doesn't touch money, nothing. Nothing we can do that, that does not have a financial aspect. So how does money live in our lives? How do we live with it in our lives? And so if we're pushing what we think is this financial health, which again, I'm not knocking it, I don't want to be confused, I don't want people to confuse that. I understand that a financial planner is trying to put together the comprehensive financial plan that gets the client what they say they want and keeps them in good stead when stuff happens. Absolutely. I get it. And we have to do that in the context of what matters most. I have, one of my students in the class right now, said that, you know, he's working with this client and the client had a very short fit, healthy, but had a short period of time to live. And the planner was trying to protect the spouse who was going to survive, right? And, and put money away. And the spouse was like, oh, no, no, no. We're going to use all this money to live this four years. And if that means I'm in a shack on the beach when I get old, so be it. I will not regret this time period with my spouse before he's no longer here. Saundra: 28:53 And so we just can't assume because that's the stuff life is made of. Right? And, and how many times have you talked to people who have tons of money and are not satisfied and the times you've talked to people who have very little money and are quite satisfied? So, so we do well to remember it is very, very seldom if ever. And I honestly, I say never just about the money. And I think to your point, getting to the need under the need because there's always something more, even when somebody says, oh, I just want to make oodles and oodles of money, tell me what that means for you. Rianka: 29:30 There's always something behind that. And it could be because they didn't have a lot growing up or because they did have a lot growing up and they're just trying to, you know, keep up with that or it's expectation that is from their parents. I met a lot of friends and peers in college who were not happy because the only reason why they were in college and having their college paid for them was because they were going through a major that their parents approved of. And so here they are the four years of their life that they can never get back. They're going to college for something that they're really not passionate about or care about, but it's something in their parents' lens that you know, that they're saying is important, like a doctor or engineering. Saundra: 30:19 Right. And we have to acknowledge the parents, and being a parent of an adult myself, the parents are doing what they think is best for that child even when that child is an adult. Rianka: 30:30 So there's just so many dynamics and so many things. The interplay of all of this that we can't ignore. And as planners, how do you hold that and help people figure out a process that's going to get them what they want and have financial health. Rianka: 30:51 Yeah. So what I'm hearing from this, from this conversation, this sounds like a discovery meeting. So for the financial planners that are, that are listening, if in your process you don't have something that is called a discovery meeting, I will encourage you to add this to your set of meetings that you have with new clients. And if you have clients that you haven't done this with, then take a step back and just have this meeting. And just like Saundra just said, don't walk into this meeting without any assumptions. It's, is much more easier when they're new clients. Saundra: 31:26 But yeah. Well that's true. And, and here's the thing, even when they're not though, you get to check your assumptions. Yes. You get to check your assumptions. And so in a coaching engagement, so say for instance, you and I were working together and we did the thing and you said, okay Saundra, this is what I'm going to do for next time. And you know, we're going to check in on it in our next meeting. When you and I meet again, my opening with you will be so Rianka last time we met, you mentioned this, you said you wanted us to check in on that. Is that what we're doing today? Rianka: 32:01 That's good. Right there. I hope everyone is taking notes cause I am definitely taking notes right now. As, as we're talking so don't make any assumptions. Something else that is very important during this discovery meeting is don't find the solutions, right? Rianka: 32:19 This, this meeting is not solutions oriented and to set expectations because this is what I get a lot with my new clients is like they're like, oh finally, finally hired a certified financial planner and she is going to fix me in three weeks. And I set, very clear expectations, the financial behaviors, the financial debt, the financial, whatever that has gotten you here has taken a lot of years. I cannot unravel how you think about money. I cannot unravel your financial behavior in three weeks. So to set a very clear expectation, this is a process, not a one time event. And I believe my clients really appreciate that because I set that stage up front. So going back to what you said Saundra, I set very clear expectations that this is going to be a process and we are in this together. And I will not leave you. Rianka: 33:17 And so in this discovery meeting, set expectations as far as just what I just mentioned, don't make any assumptions, listen and reflect back. I think that is a key thing is like listen to what the client is saying and then reflect back to them. This is what I heard you say. And then because now you have the key assumptions, you have the key, that's what we call them, financial planning assumptions that you need to plug into whatever your financial planning software, whatever the case may be. So that what they share it with you, you can reflect back to them. Saundra: 33:56 Here's what I would offer. Because in financial planning we do know that there are some appropriate assumptions, right? We assume inflation, we assume interest rates. We assume those kinds of things required rates of return. I'm not saying you can't make those assumptions, but recognize that there's a difference between discovery for the purpose of understanding and discovery for the purposes of gathering data. Rianka: 35:22 I hope y'all are pausing and writing down all these questions because these are the questions that you to, to be that, to become that trusted advisor. These are the questions that you must ask your clients. Saundra: 35:38 And then once you've got that number one, the client now knows, okay, this isn't just about my money. So you've already sent a signal, right? And then you can say, all right, one of the things that's important for you to know about my work as a planner is that there are some assumptions that I will have to make to get a good plan for you. And these are those assumptions. What do you think about this? Saundra: 36:07 Right. And so, you know, that's where you might, I mean, honestly I see people do things about, you know, a risk tolerance and all of those kinds of things. And you know, and so if you're saying these are the assumptions that I'm going to make, you know, what do you think? Where am I wrong? You know, and, and give yourself room to be wrong. Give yourself room for them to correct you because what you're getting there out of that Rianka is their ownership. Rianka: 36:34 Yes. So out of this discovery meeting and it pinpoints exactly what you said in the beginning and now we've just showed the listeners is that don't be afraid to work with someone from a different culture. You just have to have a really great discovery meeting to figure out what's important to them beyond the numbers. Rianka: 36:57 Beyond the numbers. And so when it comes to, I want to shift a little bit and I want to talk about just the history. You know, because we do, as you mentioned, America is a beautiful melting pot. It's, it's a mosaic and we're going to be working with, clients from, from different continents, different countries. If there were and, I'm putting you on the spot here, top top three major differences, that we should probably look out for, whether it's from clients who may come from Spain, clients who may come from Italy, clients who may come from Europe. What are some of the, some of the differences, like I mentioned my client from Nigeria, how, you know, from, from a, from a budgeting or, or, or spending plan perspective, a line item of their parents will always be there, you know, from, from that perspective, is there anything that you can share with us that we may want to just learn more about? Saundra: 38:00 Absolutely. So first thing I want to say is I prefer your image of the mosaic to the melting pot. You know, you got to remember, I'm a few years older, so when I was growing up, we talk about America as a melting pot. The problem with that concept, and of course it then it emerged to a salad. But, the problem with that is it is, yeah, it's really bizarre. But of course when you're raised in the 60s, you know, everything was related to some kind of food. So about the salad, well, the first, the first idea, the idea was kind of where you were going. The melting pot thing was, you know, we assimilated, I don't think that was the intention, but that's what, that's what, this country kinda did, right? That you could be successful here if you assimilated. And so that's where the idea of the melting pot now, of course then around the 70s when, was seventies and I think probably the 80s the idea of it's not so much a melting pot, but a salad because you can have your tomatoes, you can, you can have you and everybody could stay. Saundra: 39:02 You could still have your uniqueness and be blended together. Right? So there was that idea. But to me, I believe that the mosaic concept and that idea of it, that lens is that there's the beauty of it, right? So you can look at a single tile and see the beauty of that tile and you can come back and see the beauty of that tile in the context of the entire image. And so I really like, that term. So I'm going to, I'm going to be borrowing that when I, I think that that's an accurate, more accurate, particularly for how we're living today. Because one of the things that we're seeing in this tumultuous time around race is that people who have been disenfranchised are frankly tired of trying to assimilate to make it, people are tired of having their culture, taken, packaged and sold back. Saundra: 39:57 People are tired of those kinds of things. So that's why, one of the reasons that the only reason, but certainly why one of the reasons people are so vocal now about what it means to be an ally. And you did amazing work on that last season. You know, what does it mean? Do I have to withhold my truth to be able to survive here in this engagement with you? And that's core to how we work with clients. You know, and, and so I've heard many people say, well, you know, I only work with clients who are this or I only work with clients who are that. And that's fine. You know, if you've got your need, your net works for you, great. Do that. If you want to be able to work with other people or any people, it's not about them. It's about you. Who are you going to be? Saundra: 40:45 And so when I travel, one of the, the guy that traveled with this, this historian out of Los Angeles, and he says, we are not tourist, we are travelers. And, and just that mindset, shifts how we consider what we're doing. And so again, you know, I'm traveling to these, these different places. I don't, I'm not embedded in the culture, so all I can speak to is my observations about it. So the things that I noticed is that when we're in Paris, there's time of the day that people are just sitting out in the parks relaxing and playing with their kids. And you know, I didn't see a lot of nannies. You know, I saw a lot of families and there's board games and things out in the park and all of these things that are going on. And they told us, you know, we don't tip there, which was very hard for me. Saundra: 41:43 So my money script really got triggered in Paris because I'm used to tipping because people are paid such low wages in the service industry here in the United States that I feel like I'm contributing to their abuse, right? To, not to not tip, but then when I'm in Paris, you know, fair wages, better benefits tipping is not viewed as something that we do. And so then you have to reconcile, am I going to impose what my stuff is? Do I go along with the culture that I'm in. You know, what to say when in Rome. Right? So, so, so when we go to these places, when we leave this country, we, or even when people come to this country, what is the way of being there? The financial conversations that I had with people there, I didn't hear as much worry about retirement. Saundra: 42:44 I didn't hear as much stress about, financial choices. Now there's of course the same wealth gaps, maybe not as severe, but there are people who have a lot in people who have a little, when I was talking in groups where people had less when I was in Amsterdam, Paris, Belgium, you know, of course there's this, how do I make a living? It's a little bit different because not all of the places have the same social structures. So there might not be social security, there might not be public benefits. There might be more family interdependence, financially than what we might experience here. Where in this country, we're expected raise your kids, they launch, right? And then they take care of their own stuff. Right? Well, well, so it's not quite the same. You know, as, as I'm sure you know, in Spain, you know, they shut down. Saundra: 43:34 You try to go get something to eat at one o'clock and, and so, but, but the thing that I noticed is that the quality of life is so different even for people who have less. And so what I had to learn, in traveling in, in, in the outside of this country is to not assume that my perceptions and my fears and my concerns about money are shared by other people. And that what I value or what I think is, struggle is not necessarily struggle. What I think is a poor use of financial resources may not be a poor use of financial resources. So those are the things that I noticed traveling around in Europe. And, there's kind of this different, and again, these are all my observations. It's not meant to be right, wrong. There was also this perspective, that I would see is that the, the loyalty between the employer and the employee was, was a bit different from my perspective. Saundra: 44:45 It seemed as though there was this true symbiotic relationship. And so, the idea that we have here in this country now about the side hustle, which makes me absolutely insane, the idea that people should be working all the time and always trying to make a dollar. I don't think we're thinking about what are we giving up, you know, who's raising our children, who is checking on our elders? Are we sitting out in the sun? And, and taking a moment to regroup. So I think we have to remember that our way isn't always the best way or it certainly isn't the only way. So I think what I would like to leave your listeners with is that when we're thinking about culture, whether it's European culture, Latin American culture, South American, Africans on the continent, the different countries, and then, you know, there's 54 countries in Africa. Rianka: 47:30 you're a, you're a sister. You know, you are a financial coach. You are, you have so many different titles, right? That you, that you where, what, what does success look for you? What does success look like for you? Saundra: 47:46 Yeah, what does success look like for me? So it is kind of true. I am every woman. Thank you, Chaka Khan. So I will say I don't have a measure of success. I'll know that I'm being successful when I'm being my authentic self in all of the spaces that I travel. So yes, I'm a mother and I'm a partner and I'm a daughter and I'm an educator and I'm an empathetic listener to people who are struggling or, have a financial journey that they're grappling with. And, and so for me, being successful is to bring my whole self in all of those spaces and provide insights that support other people. Saundra: 48:44 And particularly in the black community. I am very much aware of my responsibility to Africans in the diaspora and, back on the continent because that's, that's really, where my heart is and not to the exclusion. But certainly, as, as a, as a very clear and present reality for me. And so I will know that I have been successful when I have brought my full self to those places and I'm learning as I teach. And, I'm remaining open to learning all the time. I, I saw this quote, and I didn't know I like Barbara Sher's book, I could do anything if I only knew what it was. The quote was, you can learn anything if you're willing to be a beginner. And I think that that is just so profound because whether it's as a financial planner, whether it's as an experienced planner or an experienced coach or a parent or an educator, whatever, if you're willing to let yourselves grow and let ourselves grow with each interaction and experience, there's really no limit to where we can go both in our relationships and engagements with other people and just for ourselves. Rianka: 50:13 Yes, yes, yes. Well, thank you so much, Saundra, for joining us today. Again, I, I'm looking over at the time, I'm like, man, it's, it's almost been an hour really. Like, I feel like we're just getting started. But is there anything else you want to share with our listeners today before, before I let you go? Saundra: 50:34 So I think one thing that is very important to me to say in any financial planning arena, particularly to people who are finding their way or are not satisfied with the, the route they have taken is that you get to choose, you get to decide what you want to do as a planner, who you want to work with, what services you want to offer them, how you want to be with them. And if you are not satisfied with the role that you're playing or the role that you are in right now, you get to choose. And there's so many ways. The wonderful thing about this profession is you truly get to do it however you want to. So if what you're doing isn't getting you what you want, do something differently.